On the 21st (Sun), enjoy the sand and surf at Lighthouse Beach and then enjoy the sand and surf at Kovalam Beach. To find ratings, where to stay, and other tourist information, go to the Kovalam journey builder app . Bengaluru to Kovalam is an approximately 3.5-hour combination of bus and flight. You can also drive; or take a bus. Expect a bit warmer evenings in Kovalam when traveling from Bengaluru in April, with lows around 30°C. Finish up your sightseeing early on the 21st (Sun) so you can travel to Thekkady. Kick off your visit on the 22nd (Mon): take a peaceful walk through Periyar Tiger Reserve forest, contemplate the waterfront views at Periyar Lake, and then identify plant and animal life at Periyar Tiger Reserve. Get ready for a full day of sightseeing on the 23rd (Tue): look for all kinds of wild species at Green Park Ayurvedic & Spices Plantation, identify plant and animal life at Elephant Junction, and then look and learn at Green land spice garden. To see photos, traveler tips, and tourist information, use the Thekkady day trip planning tool . You can do a combination of flight and taxi from Kovalam to Thekkady in 3.5 hours. Other options are to drive; or take a bus. Finish up your sightseeing early on the 23rd (Tue) so you can go by car to Kochi (Cochin). 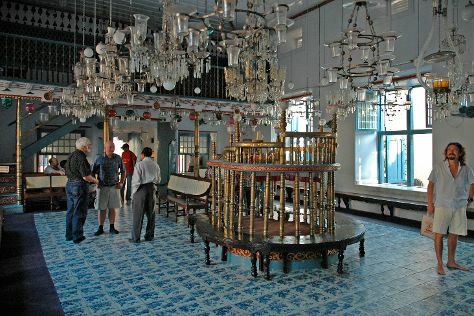 Start off your visit on the 24th (Wed): admire the striking features of Mattancherry Palace, contemplate in the serene atmosphere at Paradesi Synagogue, wander the streets of Jew Town, then admire all the interesting features of Kerala Kathakali Centre, and finally make a trip to Chinese Fishing Nets. To see photos, reviews, more things to do, and tourist information, refer to the Kochi (Cochin) trip builder site . You can drive from Thekkady to Kochi (Cochin) in 2.5 hours. Alternatively, you can take a bus. In April, plan for daily highs up to 39°C, and evening lows to 30°C. Wrap up your sightseeing on the 24th (Wed) early enough to travel back home.